Drop in painting classes are sweeping London as a craze. However, it's tricky to pick and choose between the good ones and the bad ones. Painting is a great way of winding down after a stressful day at work, as it encourages you to switch off that hectic side of your brain and let the creative side take the reigns. 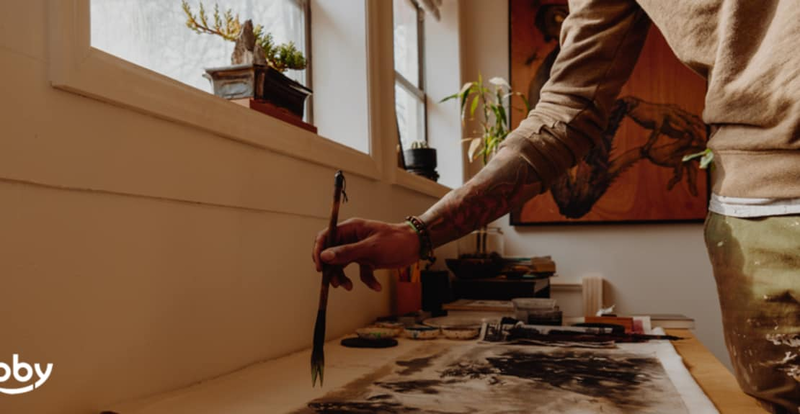 Luckily studios, artists and like-minded people all over the London have started drop-in painting classes that can solve your painting worries, no matter what they are. We've selected the best in London for drop-in painting classes, whether you are a beginner looking for something fun as a one-off or you are looking to find something local where you can learn how to paint without the commitment of a course. This company hold various painting classes around the city. Their classes are about recreating famous artists work and alongside doing that, learning the techniques they might have used to create their specific paintings. Pop Up painting is accompanied by a cheesy soundtrack and they often take place in pubs where you can purchase drinks at the bar. These classes are brilliant for a group or date activity as they are laid back and largely independent. The classes sizes can be large, and the atmosphere very chatty and light-hearted. Gareth, the founder of Pop Up Painting has often said how painting just seems to bring people together and people are always chatting away, if not about their paintings, but about things they've found in common with the person whose canvas has been placed opposite theirs. These classes started by Allan Storer who felt that London needed a casual, accessible painting course led by an artist. He has a genuine passion for teaching and is super keen to pass on his skills to students, which is what makes his classes so brilliant. At an extremely affordable price of £25 Alan invites whether you are a complete beginner or a slightly more experienced painter, just interested in getting professional guidance on your already started canvas. As a beginner, Alan will sit you down and teach you the ins and outs of oil painting, and certain techniques you need to use on paper. On the other hand, you can bring your masterpiece along with you, and Alan can help you navigate the tricky parts you might be struggling with. The only rule for this class, you must bring your own canvas! Elizabeth from Indi Skoven prints teaches her 2 and a half hour intensive watercolour class regularly in Angel, London. Open for complete novices, this class opens you up to the delicate world of painting in watercolour. This drop in painting class will begin with a short introduction to colour theory and working with cool and warm colour palettes. We will then explore colour mixing and go through some exercises to become familiar with using simple techniques and to practice different brush strokes. Nick Malone is one of the cities most notorious painters, with his beautiful large-scale canvases capturing the hearts of the art scene for a while now. On a Saturday afternoon, Nick opens his beautiful studio in Dulwich to teach painting classes to those interested. At £60 a session you are invited into his studio for the entire day from 11.00 till 4.00 and allowed free reign of Nicks art supplies. Specialising in painting, Nick will also teach you how to mix paint with other mediums and will encourage your own creativity to shine through. This amazing class with Richmond School of painting is a group activity to learn a little more about painting outdoor scenes. It can be tricky to master the art of landscape painting, especially in England as there does tend to be large chunks of the same colour. The classes will be guided by an experienced teacher, who will make sure they spend enough time on each student and encourage them to try out different mediums and potential techniques. These drop-in painting classes are perfect for if you feel your painting has become a little repetitive, and as well, you get to meet other people who also paint in a completely different way to you, and learn from them! These drop in painting classes teach you probably the most exciting thing to paint (yet overshadowed by life drawing, painting the clothed figure is full of colour mixing and expression. In the Renaissance, the expression was in the drapery - clothes are overlooked when looking at a painting but they are key in the makeup of any clothed figure, and let's be honest, everyone we see unless intimate is clothed! You will look at the clothed figure and paint with equal emphasis the hands, head and fabric. Looking at shapes, lines, colour, texture and tone and with the help of artist Alice Neel, clothes will not be a sideline to the study of the figure but a celebration. N.B. All these class do require booking, and although they offer a flexible schedule, the teachers of the class need to know numbers so they do require booking in advance.